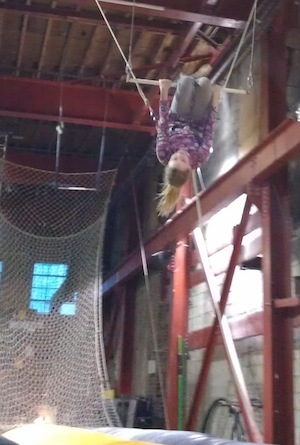 Yesterday Emma did another “catch” at her trapeze school. Yesterday’s catch was more complicated than the one she perfected a month ago and I cannot wait to see it. I asked Em last night whether I could post it here and she said, “Yes! Post on blog!” Since Em’s therapist, Joe, hasn’t had time to upload and send me the link from yesterday , I’m sorry, I can’t help myself, I am posting her first catch from a month ago AGAIN. Watch all the way through to hear what Em says at the end, it makes me teary just thinking about it. Watching her flying through the air makes me happy. Seeing her joy and sense of accomplishment, makes me happy. The first time I watched her swooshing through the air I felt a mixture of joy and trepidation, the second time a soaring hopefulness of all that is possible, the third time pride, knowing how hard she has worked, trained and practiced to get to this point. Years. Years of practicing. Just now, as I watched it again, I was reminded of how, it is the connections with other people who make our lives full and joyous. Connections rooted in trust, compassion, love, and a sense of belonging. When Emma releases the bar and reaches out to grab the forearms of the other person, I cannot help but hold my breath. Even though I know the ending to this particular story, I still hold my breath. Will they catch her? Will she fall? Will she get hurt? Can she trust them, rely on them to be there for her? As I write this I know these are universal questions. Questions I have asked with both my children in mind, questions I have asked about everyone I’ve ever loved. But in this one instance Emma trusts the other person will be there to catch her and the tears fill my eyes because they are, yet I know this won’t always be the case. As much as I want to convince myself that I have that power to always be there, to have every situation in my control, there will be times when I won’t be able to protect her from the disappointment and heartache that will come from trusting someone who cannot be relied upon. But before I drift off into a melancholy laced reverie, I have to remind myself that this is my interpretation of how my daughter may or may not feel when faced with disappointment and the deep sadness that comes with trusting someone, only to feel let down by them or worse, betrayed. My daughter has a very different outlook on life than me. She has proven to me repeatedly that my life experiences are not accurate lenses with which to view or predict her life. The beauty of being a mom is realizing my ideas about how my children will or won’t cope with the things thrown at them are not necessarily correct. I believe this is what older parents of children who are now adults refer to as “letting go”! 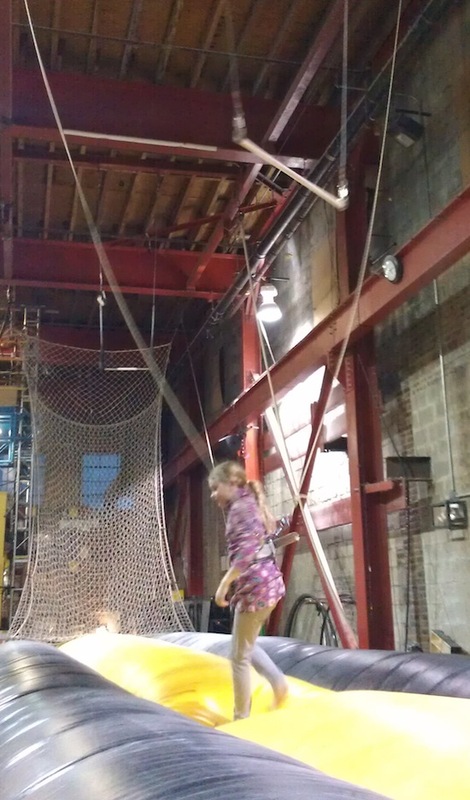 This entry was posted in Autism, Parenting, trust and tagged Autism, autistic, Elizabeth Streb, Faith, God, letting go, Parenting, Streb School, Trust. Bookmark the permalink. Watching Emma fly, knowing where she has been, made me weep. Thank you for sharing this and starting my day and others with heartfelt inspirations. Oh Lindsey, thanks so much! Yup. That’s pretty much the extent of my wisdom. No! In the past couple of years I have become really dizzy and nauseous when doing things like that. Even bungee jumping, something I used to LOVE makes me feel a little ill. So, I’m not sure I’ll be getting up there any time soon, unless “getting up there” means age-wise, in which case I’m flying! Thank you Judy. 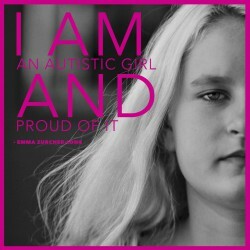 Em was extremely proud of herself, as she should be! You’re right it is the connections that we share with other people that give us joy. Every parent has those questions keep the faith and know everything will be okay. I agree! Something all parents worry about for their children….Look at her! She is soaring!!!! Soaring HIGH!!! 🙂 Such an awesome girl! Ha! Yup. Just love that. watching that video made me so happy. She is amazing, what an incredible feeling that must be to be up there like that. I would be so terrified, but she makes me want to do it too now. I love the fearlessness of kids. Me too! Terrified. But she LOVES it! 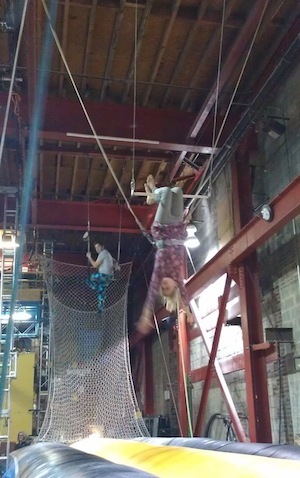 Life has a great many trapezes, I am on mine now. It’s amazing how many times people do catch each other, it’s just not that easy to remember while seeing all the “other happenstances”. I feel truly blessed to be having the time of my life now, yet it has been a journey that very well could have ended, to put it simply. Though, it hasn’t. 🙂 God bless! Petri – So pleased to hear this! Wonderful! Trapeze one ridden and not yet in bed. 😉 It was a great time, standing in the choir today. I hope Em, you and Richard have a great weekend! I have only recently come upon your blog in this past year, but reading your posts, and seeing your daughter delight in such a fun activity, makes me so happy!! I’m an SLP, and I’ve seen so many on the Spectrum denied fun, “outside the box” activities because they’re too busy sitting in chairs with therapy and participating in highly organized, restrictive activities. Bravo! !